Give your home that inviting ambiance with the right Propane or Gas Fireplace, Peterborough! We have researched and found excellent fireplace manufacturers who offer quality and style, so that you can be assured you are buying the best gas fireplace. What kind of fireplace are you looking for? Regency, Kingsman and Mendota seek to elevate the role of a fireplace beyond a heating tool to a stylized form of art, a centerpiece for the trend toward modern, streamlined home designs. These fireplaces tap into features that suit Peterborough’s new homes. Clean lines, unique materials, bold colours or sleek, understated finishes. Elegant frames wrap picturesquely around a fire that dances up from a river of pebbles or a pond of blue crystals. Whatever look you choose, prepare to impress. Enduring quality and timeless design are the mainstays of the Regency, Kingsman and Mendota traditional direct vent gas fireplace series. Fine finishes, flame that resembles real wood fires and almost endless customizing options give you the freedom to match elements of the fireplace to your Peterborough home. Choose from a series of sizes and styles so you can install a fireplace that looks natural and functional almost anywhere in your home. Your old wood burning fireplace could be more trouble than it’s worth. The drafty behemoth could be the source of consistent cool temperatures in your home, even when the furnace is pumping out the heat. Replace it with a gas insert and say goodbye to the drafty fireplace. 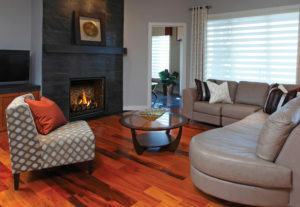 Save money by turning down your furnace and add value and efficiency to your home with a gas fireplace insert. Updated your old fireplace with a stylish propane or gas insert today!